With a powerful juicer onboard, the Oukitel K10000 Pro is a device that looks to hook you in with promise of long battery life. Its name is even an indication of the battery power it packs. The Oukitel K10000 Pro is an improvement on the K10000 announced by its Chinese maker back in 2015. Judging by the design of this phone, it appears to be built for rugged handling. It has a frame made of metal and a rear panel parading Australian calf leather. You can expect the Oukitel K10000 Pro to survive many drops. But it is about twice the thickness of some smartphones at 14 millimetres. The Oukitel K10000 Pro is also bulky at roughly 290 grams. You get ample screen estate with a large 5.5-inch display having Full HD resolution of 1080 x 1920 pixels. This looks likely to offer great viewing experience. It will have Corning Gorilla Glass on top, although the version is not known. Oukitel expectedly gives performance a boost on the K10000 Pro. It loses the unimpressive 1GHz quad-core processor of its processor, coming instead with a 1.5GHz, octa-core MediaTek MT6750T chipset. Both RAM and storage have been upgraded to 3 GB and 32 GB respectively. It is also good that the phone comes with Android 7.0 Nougat operating system. This appears to be close to the stock version. The star of the show has to be the 10,000mAh battery. This is a juicer rated to last up to 15 days on a single charge. But don’t expect it to last that long for normal usage. You can use the Oukitel K10000 Pro to boost your other devices. Oukitel promises full charge from flat state in three and half hours with its rapid charge technology. There is a 13 megapixel camera for image capturing. You will find a fingerprint scanner on the rear of the Oukitel K10000 Pro – this should still be easy to reach despite the thickness. Expect it to come with the usual connectivity options such as microUSB 2.0, Bluetooth and Wi-Fi. Oukitel K10000 Pro is available in Nigeria, Ghana, and Kenya. The price starts at $179.99 at Gearbest. You can buy the smartphone at leading online stores in your country. 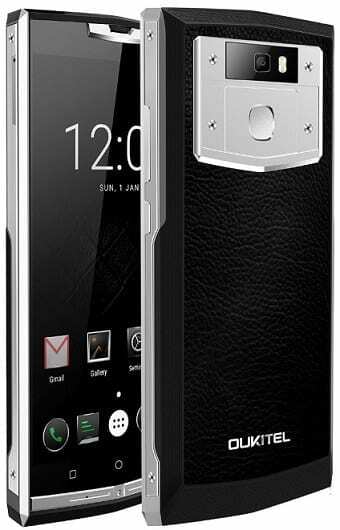 Oukitel K10000 Pro Price in Nigeria is expected to range from 67,500 Naira to 95,000 Naira.